Mary Pells was educated at the Royal Academy of Music studying cello with Derek Simpson and piano with Jean Harvey. She won awards there for chamber music and gained diplomas on both cello and piano. Further studies have included musicology with Peter Holman and viola da gamba with Alison Crum. These studies led to an M.A. in early music performance and the development of a busy career playing baroque music on original instruments. 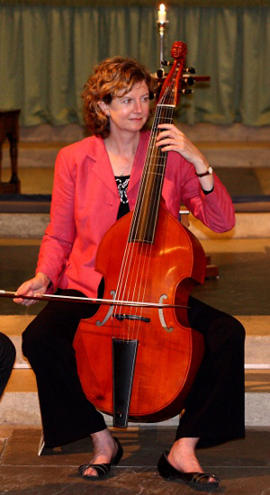 Mary has appeared as viola da gamba soloist with many groups including the Britten-Pears Baroque Orchestra, the Lecosaldi Ensemble, the Sweelinck Ensemble, Charivari Agréable, the Choir of St. John’s College Cambridge and the John Jenkins Consort. In addition to this, regular recital work has enabled her to explore and perform a large repertoire of 17th and 18th century solo music for the bass viol. She has recorded the Sonatas of J.S. Bach for Viola da Gamba and Harpsichord with the German harpsichordist, Martin Knizia. Since 2000 Mary has worked for the Associated Board of the Royal Schools of Music as a grade examiner and is now also on their diploma, jazz and trainer panels.